For the Petitioners :- Mr. Ashit Malik, Advocate. For the Respondent No. 1 :- Mr. S.S. Brar, D.A.G., Haryana. Virender Singh, J. - On the statement of one Balbir Singh the present case was registered under Sections 323/324/326/302/506/34 IPC at Police Station Shahbad. As per the allegations the present four petitioners and their co- accused namely Balbir Singh alias Bira and Amir Singh have been attributed specific injuries with different weapons. The present petitioners were, however, found innocent by the investigating agency and the challan was submitted only against Balbir Singh and Amir Singh their co-accused. During trial when the statement of the complainant was recorded, an application was moved under Section 319 Cr.P.C. for summoning the present petitioners asserting therein that they are specifically named in the F.I.R. and there is sufficient material to proceed against them. The learned Addl. Sessions Judge, vide the impugned order dated 13.1.2004 has summoned the present petitioners also to stand trial along with other two co-accused. Aggrieved by the said order of summoning, the petitioners have now knocked at the door of this Court. 2. 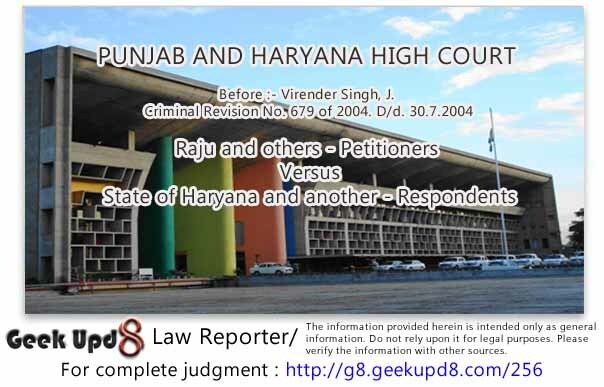 Pursuant to notice, Mr. S.S. Brar, learned D.A.G., Haryana, puts appearance for respondent No. 1 while Mr. B.L. Gulati, Advocate, appears for respondent No. 2. 3. I have heard learned counsel for either side and with their assistance have gone through the relevant available record. 4. Learned counsel does not join issue so far as attribution of specific part to the present petitioners with regard to the main incident is concerned. The only argument advanced by Mr. Malik is that in the instant case, Sonu and Avtar Singh are of the age of less than 18 years as is prima facie evident from their School Leaving Certificates Annexures P-1 and P-2 and as such in their case, there could not be a joint trial with their other co-accused on account of prohibition envisaged in Section 18 of the Juvenile Justice (Care and Protection of Children) Act, 2000 (hereinafter referred to as 'the Act'). According to Section 319 of Cr.P.C., only those accused can be summoned who can be tried together with other accused already facing trial. From this, learned counsel wants to develop that Sonu and Avtar Singh being juveniles, cannot be tried along with their other co-accused during the same trial. The very order of summoning them under Section 319 Cr.P.C. thus, is bad in the eye of law. He then contends that the only remedy open to the complainant in this eventuality is to resort to filing of a complaint against the accused who are juveniles. For Gurmukh Singh petitioner, the learned counsel fairly states that there is no documentary evidence regarding age. 5. The arguments advanced by learned counsel for the petitioners are opposed from other side vehemently contending that there is no doubt that as per provisions of Section 18 of the Act, no juvenile shall be charged or tried for any offence together with the person who is not a juvenile, but at the same time, it cannot be said that a juvenile cannot be summoned as an accused under Section 319 Cr.P.C. It is then contended that as to whether Sonu and Avtar Singh are, in fact, juvenile or not, is yet to be determined by the competent Court for which the complainant side would show its protest and for this reason as well, the plea taken by learned counsel for the petitioners is pre- mature at this stage. 6. The point being debatable in this case is as to whether the accused who is a juvenile and found innocent during investigation can be summoned under Section 319 Cr.P.C. to face trial with his co-accused. (1) Where, in the course of an enquiry into, or trial of, an offence, it appears from the evidence that any person not being the accused has committed any offence for which such person could be tried together with the accused, the Court may proceed against such person for the which he appears to have committed. 5. This section is couched in a clear and unambiguous language. It, therefore, needs no serious discussion. The emphasis is on the words "any offence for which such person could be tried together with the accused". No doubt, if a juvenile is summoned to face trial under Section 319 Cr.P.C., there cannot be any joint proceedings against him with a person not being a juvenile as is clear from Section 18(1) of the Act. But in my view Section 319(1) Cr.P.C. cannot be split up. When read as whole there remains no scope of any doubt that it gives powers to the trial Court to proceed against other accused appearing to be guilty of offence. 6. A plain reading of the Section 319 Cr.P.C makes it clear that when it appears to the Court from the evidence that any person not being an accused has committed an offence, the Court may proceed against such person. The legislative intent is very clear and it does not call for exhaustive consideration. At the time of summoning, the trial Court is not to see as to whether the person who is to be proceeded against is a juvenile or not. That stage will come only when the accused appears before it and claims to be a juvenile. In case, he can prima facie show to the court on the basis of any documentary evidence that he was a juvenile at the time of alleged occurrence, his case can be segregated from others for the purpose of trial or he can be sent to Juvenile Board as well with regard to determination of his age. If later any accused turns out to be a juvenile, the forum and the manner of trial would automatically change. Summoning and trial are evidently mutually exclusive; Section 18 sub-section (2) of the Act deals with similar type of situation. If the accused who is not a juvenile, has been charged and tried together with the juvenile, the Board taking cognizance of offence can direct separate trial of the Juvenile and other person on account of prohibition contained in Section 18 of sub-section (1) of the Act. On the same analogy, if trial Court after summoning the accused under section 319 Cr.P.C. comes to the conclusion that the person against whom proceedings have been initiated is, in fact, a juvenile, his trial can be held under the Act. In other words it can be said that the trial is prohibited and not the summoning. In case, arguments advanced by learned counsel for the petitioners are accepted, it would be giving handle to the Investigating Agency not to challan the accused, who simply claims to be a juvenile, and, therefore, the trial Court would also be precluded from summoning the said accused under Section 319 Cr.P.C. In other words it amounts to overreaching the law. 7. As a sequel to what is discussed hereinabove, I do not find any substance in the submissions made by the learned counsel for the petitioners and the same are hereby repelled. The instant petition merits dismissal. Order accordingly. 8. Proceedings qua all the four petitioners were stayed by this Court vide order dated March 15, 2003. If now on appearance, Sonu and Avtar petitioners, or may be Gurmukh Singh, petitioner, on the basis of documentary evidence convince the trial Court that they were juveniles at the time of the alleged occurrence, the trial Court would take a lenient view with regard to their bail. 9. The net result is that the present revision petition is dismissed.